their place on stage Monday night. recently released 10th studio album The Incident. then come back to play a full hour of older tunes. processing) and renowned drummer Gavin Harrison. PT's talented riffer Colin Edwin (saz/bass/guimbri) completed the live band lineup. that created changing shape and color variations internally, within the guitar. half with the sentimental "I Drive The Hearse." closed the second half with one of their darkest songs "Bonnie the Cat (The Incident, 2009)." of "Trains (In Absentia, 2002)" which included a powerful collective crowd clapping fill in. Before leaving stage Wilson said a second US leg is likely after completing their over seas winter tour. and have released 12 albums. The Missouri-based band opened with "Alright" and also played "Pray" and "We Were Born To Be Loved." in your life, with or without success. I'd like to thank my best friend for introducing me to Porcupine Tree. best live performances, which includes Nine Inch Nails and 311. 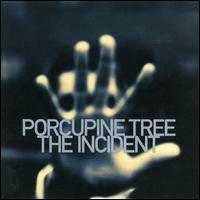 Porcupine Tree's The Incident cover art.